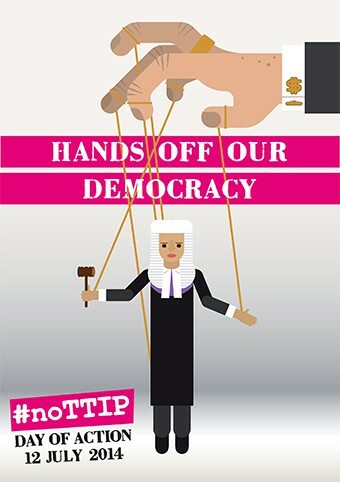 Jubilee Debt Campaign is part of the #noTTIP day of action this Saturday 12 July. Here we explain what the EU-US trade deal means for debt and global finance. The Transatlantic Trade and Investment Partnership (TTIP) is a ‘free trade’ agreement being negotiated between the EU and US. It could have big implications for how various industries are regulated, including making it harder to control banks and prevent debt and financial crises in the future. As with other ‘free trade’ agreements that have gone before, proponents in government and business are predicting TTIP will increase economic growth, whilst ignoring how trade agreements have increased inequality, cost jobs and made it harder for governments to regulate what companies do. Just as worrying is that TTIP is largely being negotiated in secret, away from the scrutiny of parliaments and far from the public domain, in an effort to rush through an agreement, without any opposition. Yet the consequences are potentially devastating for people across Europe and the United States. One of many alarming elements of the proposed agreement is the aim to reduce ‘non tariff barriers to trade’. These ‘barriers’ are the very regulations which campaigners have fought hard over many years to obtain, and which mean people have labour rights, food standards and environmental protection to name just a few. The so-called ‘harmonisation’ of regulations will lead to what has been dubbed a ‘race to the bottom’ as countries compete against each other for fear of companies taking their production elsewhere. Of major concern to the Jubilee Debt Campaign is the risk of creating a new international financial crisis. Rules are being proposed for TTIP that would prevent either the EU or US from bringing in regulations on banks. This includes preventing regulations such as controls on lending and bans on the use of high-risk financial instruments. In the aftermath of the 2008 crisis the US has actually been more active in re-regulating banks, but there are fears in the US that these new rules might be removed in order to bring the US in line with the weaker standards of the EU. It doesn’t end there though. Further proposals include mandatory consultations with stakeholders (ie, banks and other finance companies) for any financial regulations proposed in the EU and US. This means the financial sector will be able to halt new regulations before any legislation reaches a parliament. Furthermore, a chapter in the current draft of TTIP includes creating company-to-state dispute settlement mechanisms. Such mechanisms would allow EU and US-based corporations to sue governments at international arbitration tribunals (which in themselves are becoming a lucrative industry encouraging lawyers to fuel disputes) for any potential or future loss of profit or damage to investment, including from the introduction of new regulations. If and when they are successful, companies winning such cases would then come to be owed a debt by the government concerned, as has happened recently for Argentina and Ecuador. This would essentially hand power over to transnational corporations, giving them free rein to challenge government regulations to protect the environment, public health, and workers’ and consumers’ rights. As with many of the rules laid out by TTIP, it is hoped that standards such as the state-to-investor dispute settlement systems set by these two economic superpowers will create a model that will be adopted by the rest of the world. This is a frightening prospect. One consequence of the agreement of particular concern to debt campaigners is that it will tilt the balance of power even further against countries in debt crisis. In the event that a government needed to negotiate to reduce the amount of debt it owed, it would be in a weaker position as creditors would have even more legal ways of suing governments if debts are not paid. This would particularly strengthen the power of vulture funds – financial speculators who buy up cheap debt from governments in crisis. Vulture funds refuse to take part in necessary debt reductions when governments can’t keep up with their debt payments, then look for ways to sue for full payment of the debt in the courts, which normally represents a huge profit for them. Provisions under TTIP could make it even easier for vulture funds to sue future European governments which are unable to pay all their debts. EU and US negotiators for TTIP seem intent on ignoring lessons to be learned from past financial crises. They are intent on forcing the liberalisation of financial services, a system proven not to work, with disastrous consequences on a global scale. Since the financial crisis, it has been acknowledged that financial stability is a public good. The undoing of regulations that maintain it, alongside a massive transfer of power to the financial sector, is therefore deeply concerning. Profit-making should not take priority over jobs, livelihoods, public services and the protection of the environment, and further reform of the financial sector is imperative to ensure that citizens are protected from another financial crisis. If TTIP goes ahead, it will become ever harder for people to stand up against the financial sector and transnational corporations.